With the help of Michael Meyer of Rate-Highway Inc. and Jim Tennant of The Tennant Group, Auto Rental News publishes monthly auto rental rate surveys for six major airports in the cities of Boston (BOS), Miami (MIA), Chicago (ORD), Houston (HOU), Seattle (SEA) and Los Angeles (LAX). The rates are based on weekly surveys and are published monthly. Look for a company-by-company comparison in the 2013 Auto Rental News Fact Book. There will also be a session on rates and rate management at the next Car Rental Show, April 15-16, 2013 at the Rio in Las Vegas. Rate data provided by Rate-Highway, a provider of revenue management services for the auto rental industry. Rates are an average of aggregator/OTA rates for all vendors present in the markets listed on the date of the survey. 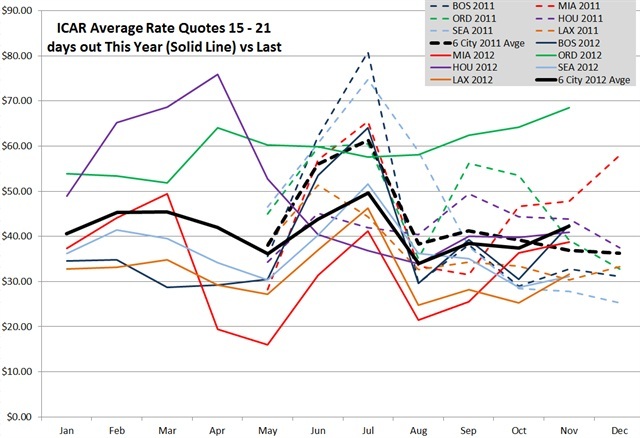 November 2012 rate quote averages saw a significant uptick compared to last year at an increase of $5.29. Before November, the difference in year-to-year rate quotes had been declining, with October 2012 down only $1.77 from the previous year. November saw the first year-over-year increase since we began these surveys in May 2011. All the individual cities improved in November, with Miami and Houston still down, but less than previously, in the year-to-year comparison. Los Angeles, Seattle, Boston and Chicago are all up over last year. Chicago continued to show extraordinary strength, up $29.45 over last year. These tables and graph show the average of all base rate quotes per day for an ICAR at the six airports shown for arrivals 15 to 21 days ahead of the date of the survey, for two- and seven-day rentals. If the arrival date is a Friday or Saturday, the two-day rate will be a weekend rate, otherwise it will be a regular rate. To see October's car rental rate analysis click here.